The cashew tree (Anacardium occidentale) is a tropical evergreen tree that produces the cashew seed and the cashew apple. It can grow as high as 14 m (46 ft), but the dwarf cashew, growing up to 6 m (20 ft), has proved more profitable, with earlier maturity and higher yields. The species is native to Central America, the Caribbean Islands, and northern South America. Portuguese colonists in Brazil began exporting cashew nuts as early as the 1550s. In 2017, Vietnam, India, and Ivory Coast were the major producers. The cashew seed, often simply called a cashew, is widely consumed. It is eaten on its own, used in recipes, or processed into cashew cheese or cashew butter. The shell of the cashew seed yields derivatives that can be used in many applications including lubricants, waterproofing, paints, and arms production, starting in World War II. The cashew apple is a light reddish to yellow fruit, whose pulp can be processed into a sweet, astringent fruit drink or distilled into liquor. Its English name derives from the Portuguese name for the fruit of the cashew tree caju (Portuguese pronunciation: [kaˈʒu]), which itself is derived from the Tupian word acajú, literally meaning "nut that produces itself". The generic name "Anacardium" (derived from Greek ἀνά (aná), meaning "outside," and καρδία (kardía), meaning "heart", refers to the unusual location of the seed (the heart) outside of the fruit. The cashew tree is large and evergreen, growing to 14 m (46 ft) tall, with a short, often irregularly shaped trunk. The leaves are spirally arranged, leathery textured, elliptic to obovate, 4–22 cm (1.6–8.7 in) long and 2–15 cm (0.79–5.91 in) broad, with smooth margins. The flowers are produced in a panicle or corymb up to 26 cm (10 in) long; each flower is small, pale green at first, then turning reddish, with five slender, acute petals 7–15 mm (0.28–0.59 in) long. The largest cashew tree in the world covers an area around 7,500 m2 (81,000 sq ft); it is located in Natal, Rio Grande do Norte, Brazil. The fruit of the cashew tree is an accessory fruit (sometimes called a pseudocarp or false fruit). What appears to be the fruit is an oval or pear-shaped structure, a hypocarpium, that develops from the pedicel and the receptacle of the cashew flower. Called the cashew apple, better known in Central America as marañón, it ripens into a yellow or red structure about 5–11 cm (2.0–4.3 in) long. It is edible and has a strong "sweet" smell and taste. The true fruit of the cashew tree is a kidney or boxing-glove shaped drupe that grows at the end of the cashew apple. The drupe develops first on the tree, and then the pedicel expands to become the cashew apple. Within the true fruit is a single seed, which is often considered a nut, in the culinary sense. The seed is surrounded by a double shell containing an allergenic phenolic resin, anacardic acid, a potent skin irritant chemically related to the better-known allergenic oil urushiol which is also a toxin found in the related poison ivy. Some people are allergic to cashews, but cashews are a less frequent allergen than tree nuts or peanuts. 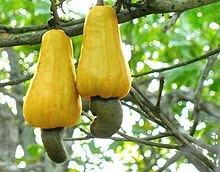 While the cashew plant is native to northeast Brazil, the Portuguese took it to Goa, India, between 1560 and 1565. From there, it spread throughout Southeast Asia and eventually Africa. 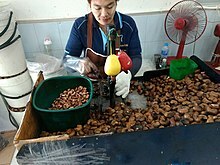 A woman uses a machine to shell cashews in Phuket, Thailand. Culinary uses for cashew seeds in snacking and cooking are similar to those for all tree seeds called nuts. 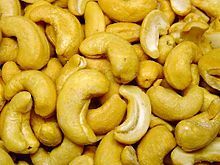 Cashews are commonly used in Indian cuisine and Pakistani cuisine, whole for garnishing sweets or curries, or ground into a paste that forms a base of sauces for curries (e.g., korma), or some sweets (e.g., kaju barfi). It is also used in powdered form in the preparation of several Indian sweets and desserts. In Goan cuisine, both roasted and raw kernels are used whole for making curries and sweets. Cashews are also used in Thai and Chinese cuisines, generally in whole form. In the Philippines, cashew is a known product of Antipolo, and is eaten with suman. The province of Pampanga also has a sweet dessert called turrones de casuy, which is cashew marzipan wrapped in white wafers. In Indonesia, roasted and salted cashews are called kacang mete or kacang mede, while the cashew apple is called jambu monyet (translates in English to monkey rose apple). In the 21st century, cashew cultivation increased in several African countries to meet the demands for manufacturing cashew milk, a plant milk alternative to dairy milk. In Mozambique, bolo polana is a cake prepared using powdered cashews and mashed potatoes as the main ingredients. This dessert is popular in South Africa. In Brazil, cashew fruit juice and the fruit pulp are used in the production of sweets, juice, alcoholic beverages, such as cachaça, and as a flour, milk or cheese. In Panama, the cashew fruit is cooked with water and sugar for a prolonged time to make a sweet, brown, paste-like dessert called dulce de marañón, with marañón as a Spanish name for cashew. The shell of the cashew nut contains oil compounds which may cause contact dermatitis similar in severity to that of poison ivy, primarily resulting from the phenolic lipids, anacardic acid, and cardanol. Due to the possible dermatitis, cashews are typically not sold in the shell to consumers. Readily and inexpensively extracted from the waste shells, cardanol is under research for its potential applications in nanomaterials and biotechnology. In 2017, global production of cashew nuts (as the kernel) was 3,971,046 tonnes, led by Vietnam, India and Côte d'Ivoire with 22%, 19%, and 18% of the world's total respectively(table). Benin, Guinea-Bissau, Tanzania, Mozambique, Indonesia, and Brazil also had significant production of cashew kernels. In 2014, rapid growth of cashew cultivation in Côte d'Ivoire made this country the top African exporter. Fluctuations in world market prices, poor working conditions, and low pay for local harvesting have caused discontent in the cashew nut industry. The cashew tree is cultivated in the tropics between 25°N and 25°S, and is supremely adapted to hot lowland areas with a pronounced dry season, where the mango and tamarind trees also thrive. The traditional cashew tree is tall (up to 14 m) and takes three years from planting before it starts production, and eight years before economic harvests can begin. More recent breeds, such as the dwarf cashew trees, are up to 6 m tall, and start producing after the first year, with economic yields after three years. The cashew nut yields for the traditional tree are about 0.25 metric tons per hectare, in contrast to over a ton per hectare for the dwarf variety. Grafting and other modern tree management technologies are used to further improve and sustain cashew nut yields in commercial orchards. In a 100-gram serving, raw cashews provide 553 Calories, 67% of the Daily Value (DV) in total fats, 36% DV of protein, 13% DV of dietary fiber and 11% DV of carbohydrates (table). Cashews are rich sources (> 19% DV) of dietary minerals, including particularly copper, manganese, phosphorus, and magnesium (79-110% DV), and of thiamin, vitamin B6 and vitamin K (32-37% DV) (table). Iron, potassium, zinc, and selenium are present in significant content (14-61% DV) (table). Cashews (100 grams, raw) contain 113 milligrams (1.74 gr) of beta-sitosterol. For some 6% of people, cashews can lead to complications or allergic reactions which may be life-threatening. These allergies are triggered by the proteins found in tree nuts, and cooking often does not remove or change these proteins. Reactions to cashew and tree nuts can also occur as a consequence of hidden nut ingredients or traces of nuts that may inadvertently be introduced during food processing, handling, or manufacturing, particularly in people of European descent. Cashew oil is a dark yellow oil for cooking or salad dressing pressed from cashew nuts (typically broken chunks created during processing). This may be produced from a single cold pressing. Cashew nutshell liquid (CNSL) or cashew shell oil (CAS registry number 8007-24-7) is a natural resin with a yellowish sheen found in the honeycomb structure of the cashew nutshell, and is a byproduct of processing cashew nuts. It is a raw material of multiple uses in developing drugs, antioxidants, fungicides, and biomaterials. It is used in tropical folk medicine and for antitermite treatment of timber. Its composition varies depending on how it is processed. Cold, solvent-extracted CNSL is mostly composed of anacardic acids (70%), cardol (18%) and cardanol (5%). Heating CNSL decarboxylates the anacardic acids, producing a technical grade of CNSL that is rich in cardanol. Distillation of this material gives distilled, technical CNSL containing 78% cardanol and 8% cardol (cardol has one more hydroxyl group than cardanol). This process also reduces the degree of thermal polymerization of the unsaturated alkyl-phenols present in CNSL. Anacardic acid is also used in the chemical industry for the production of cardanol, which is used for resins, coatings, and frictional materials. These substances are skin allergens, like the oils of poison ivy, and present danger during manual cashew processing. This natural oil phenol has been found to have interesting chemical structural features which enable a range of chemical modifications to create a wide spectrum of biobased monomers capitalizing on the chemically versatile construct, containing three different functional groups: the aromatic ring, the hydroxyl group, and the double bonds in the flanking alkyl chain. These can be split into key groups, used as polyols, which have recently seen a dramatic increase in demand for their biobased origin and key chemical attributes such as high reactivity, range of functionalities, reduction in blowing agents, and naturally occurring fire retardant properties in the field of ridged polyurethanes aided by their inherent phenolic structure and larger number of reactive units per unit mass. CNSL may be used as a resin for carbon composite products. CNSL-based Novolac is another versatile industrial monomer deriving from cardanol typically used as a reticulating agent for epoxy matrices in composite applications providing good thermal and mechanical properties to the final composite material. The cashew apple, also called cashew fruit, is the fleshy part of the cashew fruit attached to the cashew nut. The top end of the cashew apple is attached to the stem that comes off the tree. The bottom end of the cashew apple attaches to the cashew nut, which is encased in a shell. In botanical terms, the cashew apple is an accessory fruit that grows on the cashew seed (which is the nut). The cashew apple can be eaten fresh, cooked in curries, or fermented into vinegar, as well as an alcoholic drink. It is also used to make preserves, chutneys, and jams in some countries such as India and Brazil. In many countries, particularly in South America, the cashew apple is used to flavor drinks, both alcoholic and nonalcoholic. Cashew nuts are more widely traded than cashew apples, because the apple, unlike the nut, is easily bruised and has very limited shelf life. Cashew apple juice, however, may be used for manufacturing blended juices. In cultures that consume cashew apples its astringency is sometimes removed by steaming the fruit for five minutes before washing it in cold water; alternatively, boiling the fruit in salt water for five minutes or soaking it in gelatin solution also reduces the astringency. In Goa, the cashew apple is mashed and the juice extracted and kept for fermentation for a few days. Fermented juice then undergoes a double distillation process. The resulting beverage is called feni or fenny. Feni is about 40–42% alcohol. The single-distilled version is called urrac, which is about 15% alcohol. In the southern region of Mtwara, Tanzania, the cashew apple (bibo in Swahili) is dried and saved. Later, it is reconstituted with water and fermented, then distilled to make a strong liquor often referred to by the generic name, gongo. In Mozambique, cashew farmers commonly make a strong liquor from the cashew apple. It is known under various names in the local languages of Mozambique (muchekele in Emakua spoken in the North, xicadju in Changana spoken in the South). In contrast to the above-mentioned Feni of Goa, the cashew liquor made in Mozambique does not involve the extraction of the juice from the cashew apples. Following harvest and the removal of the nuts, the apples are spread on the ground under trees and courtyards and allowed to lose water and ferment. The shrivelled fruits are then used for distillation. According to one source, an alcohol had been distilled in the early 20th century from the juice of the fruit, and was manufactured in the West Indies. Discarded cashew nuts unfit for human consumption, alongside the residues of oil extraction from cashew kernels, can be used to feed livestock. Animals can also eat the leaves of cashew trees. View of a Cashew tree stem in Lawachara National Park, Bangladesh. Photo of 2016. Semecarpus anacardium (the Oriental Anacardium) is a native of India and is closely related to the cashew. ^ a b c d e f g Morton, Julia F (1987). "Cashew apple, Anacardium occidentale L." Fruits of warm climates, Julia F. Morton. Center for New Crops and Plant Products, Department of Horticulture and Landscape Architecture, Purdue University, W. Lafayette, IN. pp. 239–240. ISBN 978-0-9610184-1-2. Archived from the original on 2007-03-15. Retrieved 2007-03-18. ^ "Cashew". Department of Horticulture, Cornell University. 20 October 2015. Retrieved 16 March 2019. ^ Carolyn Joystick, "Cashew Industry" in Encyclopedia of Latin American History and Culture, vol. 2, p. 5. New York: Charles Scribner's Sons 1996. ^ Jostock, "Cashew Industry", p. 5. ^ Varghese, T.; Pundir, Y. (1964). "Anatomy of the pseudocarp in Anacardium occidentale L.". Proceedings of the Indian Academy of Sciences, Section B. 59 (5): 252–258. ^ Rosen, T.; Fordice, D. B. (April 1994). "Cashew Nut Dermatitis". Southern Medical Journal. 87 (4): 543–546. doi:10.1097/00007611-199404000-00026. PMID 8153790. ^ Osborn M (26 August 2015). "Access to Market Data and Supply Chain Visibility offer Economic Boost to Ghana Cashew Farmers". Consumer Goods Technology. Archived from the original on 2016-06-04. Retrieved 11 May 2016. ^ Phillippa Cheifitz (2009). South Africa Eats. Archived from the original on 2013-12-11. Retrieved 2012-08-19. ^ Edi Souza (2018-07-28). "It's cashew time at the fair and on the plate (translated)" (in Portuguese). Folha de Pernambuco. Archived from the original on 2018-08-21. Retrieved 2018-08-21. ^ Rosen T.; Fordice, D. B. (1994). "Cashew nut dermatitis". South Med J. 87 (4): 543–46. doi:10.1097/00007611-199404000-00026. PMID 8153790. ^ "Why Cashews Aren't Sold In The Shell". Moment of Science, Indiana Public Media. September 6, 2013. Archived from the original on 2016-02-20. Retrieved 2016-02-22. ^ a b c d Hamad F. B.; Mubofu E. B. (2015). "Potential biological applications of bio-based anacardic acids and their derivatives". Int J Mol Sci. 16 (4): 8569–90. doi:10.3390/ijms16048569. PMC 4425097. PMID 25894225. ^ "FAOSTAT of the United Nations". FAOSTAT of the United Nations. Archived from the original on 7 January 2019. Retrieved 7 January 2019. ^ Bavier, Joe (29 October 2014). "War-scarred Ivory Coast aims to conquer the world of cashews". Reuters. Retrieved 9 February 2015. ^ "Tanzania riots over cashew nut payments". BBC. 24 April 2013. Archived from the original on 2013-05-21. Retrieved 14 May 2013. ^ Lamble L. (2 November 2013). "Cashew nut workers suffer 'appalling' conditions as global slump dents profits". The Guardian. Retrieved 6 September 2015. ^ Wilson B. (4 May 2015). "'Blood cashews': the toxic truth about your favourite nut". The Telegraph. Retrieved 6 September 2015. ^ "Cultivating Cashew Nuts". ARC-Institute for Tropical and Subtropical Crops, South Africa. Archived from the original on 2015-02-21. Retrieved February 15, 2015. ^ a b c d "Full Report (All Nutrients): 12087, Nuts, cashew nuts, raw, database version SR 27". Agricultural Research Service – United States Department of Agriculture. 2015. Archived from the original on 2015-08-18. Retrieved 6 August 2015. ^ a b McWilliam V.; Koplin J.; Lodge C.; Tang M.; Dharmage S.; Allen K. (2015). "The prevalence of tree nut allergy: a systematic review". Curr Allergy Asthma Rep. 15 (9): 555. doi:10.1007/s11882-015-0555-8. PMID 26233427. ^ a b c "Cashew Allergies". Informall Database – funded by European Union. 2010. Archived from the original on 29 October 2010. ^ "Food Allergies – INFOSAN" (PDF). World Health Organization. 2006. ^ "Cashew Oil". Smart Kitchen. Retrieved February 15, 2015. ^ a b Alexander H. Tullo (September 8, 2008). "A Nutty Chemical". Chemical and Engineering News. 86 (36): 26–27. doi:10.1021/cen-v086n033.p026. ^ a b c "Exposure and Use Data for Cashew Nut Shell Liquid" (PDF). United States Environmental Protection Agency. Archived from the original (PDF) on 2013-05-12. Retrieved 2012-01-12. ^ Ferri, Enrico (22 May 2011). "Bioresins Derived from Cashew Nutshell Oil". MaterialsToday. Archived from the original on 2015-09-10. Retrieved 7 September 2011. ^ a b Strom, Stephanie (2014-08-08). "Cashew Juice, the Apple of Pepsi's Eye". The New York Times. ISSN 0362-4331. Retrieved 2015-11-24. ^ Azam-Ali and Judge (2004). Small-scale cashew nut processing (PDF). FAO, United Nations. Archived (PDF) from the original on 2017-02-15. Retrieved 2017-06-03. ^ Percival, Robert (1803). An Account of the Island of Ceylon: Its History, Geography, Natural History, with the Manners and Customs of its various Inhabitants. London: C. & R. Baldwin. Jostock, Carolyn. "Cashew Industry" in Encyclopedia of Latin American History and Culture, vol. 2, p. 5. New York: Charles Scribner's Sons 1996. Olaya, Clara Inés. "Cajú/ Marañon/ Merey/Acaiu/Cashew Nut", in Americas 42, no. 3 (1990), 52–53. Wikimedia Commons has media related to Anacardium occidentale. Handbook of Energy Crops – Anacardium occidentale L.